A nickel plated moneybox featuring a ring motif. 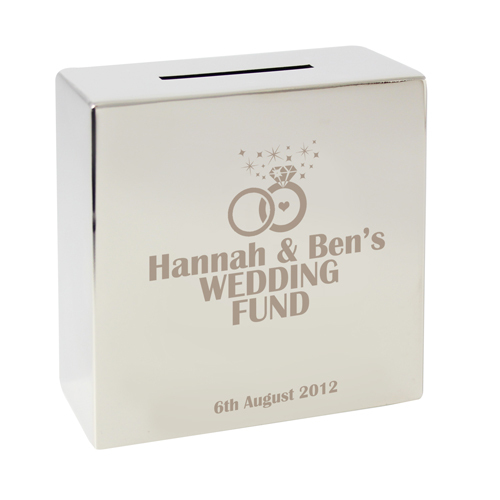 Personalise this silver finish moneybox with up to 3 lines of 20 characters underneath the ring design. You can also add a longer message of up to 35 characters at the bottom of the front of the moneybox. Money slot is suitable for all coins and notes, with a plastic swivel stopper on the base of the moneybox. Personalise with up to 3 lines of 20 characters underneath the ring design. You can also add a longer message of up to 35 characters at the bottom of the front of the moneybox.